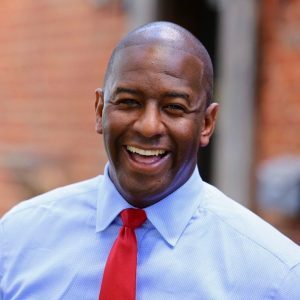 Andrew Gillum is running for Governor to rebuild Florida into a state that works for all of us. He knows everyone deserves good-paying jobs so they can support their families. He wants to protect and expand Floridians’ access to quality, affordable healthcare, especially people with pre-existing conditions. He knows we need to strengthen our public schools and end the culture of high-stakes testing. As Governor, he will fight against the special interests that are standing in the way of taking real action on climate change, and he will always ensure Florida is a welcoming and safe place for everyone, no matter where they come from, who they love or how they identify. Andrew was born in Miami where his mother drove a school bus and his father was a construction worker. He was the first in his family to graduate college and he went on to become the youngest person in history elected to the Tallahassee City Commission, before later becoming Mayor. He has a proud record of 15 years in public service. As Mayor, Andrew developed a thriving innovation economy, beat the gun lobby in court to protect commonsense reform and stood up to President Trump and Governor Rick Scott to defend immigrants. Under Andrew’s leadership, Tallahassee advanced workforce training programs for underrepresented workers as one of only 50 cities in the nation included in President Obama’s TechHire program. Andrew also helped lower violent crime in the City by more than 8 percent through increased investments in law enforcement, community policing, re-entry programs, and an expansion of social service funding. Mayor Gillum is now running for Governor because we need a fresh approach to solving the problems of our state and get our government back on track. He lives with his wife R. Jai and their three children in Tallahassee, Florida.